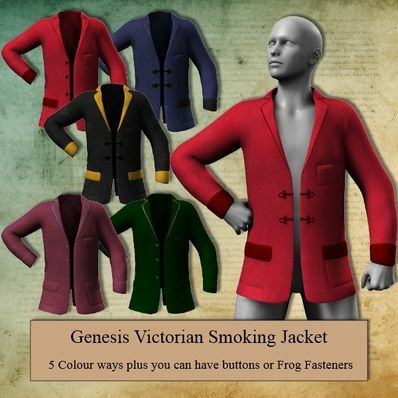 A Victorian Smoking Jacket for Genesis for use in Daz Studio 4.6. Several textures included. Hide and Show MATs for both buttons and frog fasteners so you can choose which you prefer. Unzip and copy the data, People and runtime folders to your "/Documents/DAZ 3D/Studio/My Library" folder.